Aiden is a gorgeous seven month old Border Collie mix who was adopted as a young pup and recently returned through no fault of his own. He's doing fantastic in his foster home and responding great with reward-based training. We don't want him to end up in the wrong hands again so will be ultra careful with his placement and prefer an adopter who is well experienced with the breed. City life may not be for him as he needs to run. Life in a crate is not for him either, but he will tolerate the crate much better now than when we first got him back. Someone who can exercise him and challenge his intelligence would be right up his alley. He is shy with strangers, especially men, but bonds closely with the family. He will need to be socialized in a positive setting and rewarded according. Border Collies are highly sensitive and intelligent dogs and must have a reward-based program and adequate exercise. A physical fence is a must for Aiden. Because of a bad experience with the electric fence, he will cower when he hears a beep, even from a cell phone or camera. We've rehabilitated other Border Collies with the same issues and have been very successful so we have every confidence that Aiden can be brought to respond without fear to those types of sounds. Aiden is a joy and is really having a blast in his foster home. He is very much a puppy and will need close supervision as any puppy would. 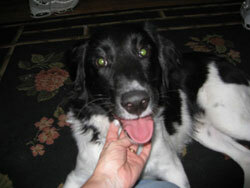 He will give back a lifetime of joy to the right adopter who understands the Border Collie nature. He is not extremely high energy as some Border Collies are, but needs to be able to have a couple of good runs a day and not too much time in the crate. Wonderfully active/beautiful black border collie mix 1 year plus, totally housetrained, smart as a whip, comes when called, not a counter surfer, no food issues, not a chewer, knows several commands, loves all people and animals. Will chase squirrels all day long, but quiet inside and loyal like only a dog can be. This boy needs an active lifestyle with people who can appreciate his need for movement! Still a touch mouthy but that behavior will go away with maturity. Does not need a crate, loves riding in the car. Does shed, needs to be brushed to control the shedding. A wonderful dog for the right family! He went to work with his previous owner and was a perfect gentleman! Don't judge him by his picture. Black dogs don't photograph well, so his picture won't do us justice. Please apply and we will get back to you right away. He's neutered, up to date on vaccines, etc. Albert is one of two spaniel mix puppies who will be arriving in August. Their mother showed up as a stray in TN and a family took her in and allowed her to have her pups. All of the pups are super friendly, playful and outgoing. We will know more about these little guys when they arrive. No phone calls please. 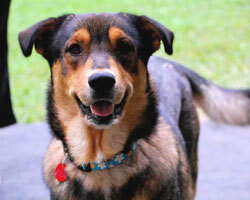 Annie is a 1-2 year old Shepherd mix and is the mom to Prissy, Casper and Thumper. She is a sweet dog who showed up as a stray who was pregnant. Some kind dog-lovers took her in and let her have her pups. She was a good mama to them and is sweet and friendly to everyone she meets. Annie is good with kids, cats and dogs of all sizes. 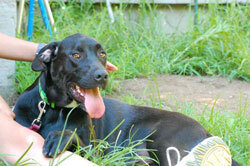 She was fostered with two smaller dogs and loves her buddy Sparky who is coming up with her. They were fostered together for two months and played, ate and slept together. She arrives on 8/6/08 and will be at our Meet and Greet at Esp. for Pets in Sudbury from 1-3. Benson is an awesome dog. His pictures don't do him justice as he's so cute. He is a small male lab mix just under a year old who came into rescue at 8 or 9 months of age and was in a foster home in TN, but he's here now and having a great time with our teen volunteers. He is house trained, good in the house, doesn't counter-surf, got on the couch once, but responded to "off". He loves to play 'tug' with the foster's resident dog. Just a great dog who everyone loves. He has typical young lab energy. He is around 45-50#...and is small for a lab. He loves everyone and never meets a stranger. He plays with everyone, even the little puppies and he doesn't overpower them like some adolescent dogs. He is neutered. History: Benson was turned in to a county animal control and was too nice to be put to sleep as he was good with people and dogs, so he went to rescue. He has a big heart, is going to make someone a great dog, just needs a fair amount of exercise. Not one for the crate all day, but would be great at doggy daycare. He does crate well when he has to be crated, but it can't be every day. Derek is a one year old 65 lb. 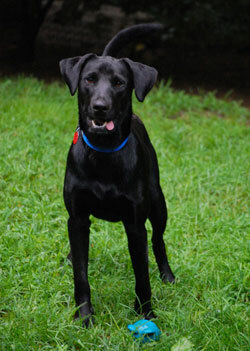 Lab mix who was rescued as a pup along with his brother Dover in TN. His brother, Dover, has some Dane features, but he doesn't. He's more labby. He walks well on a leash and will do anything for a belly rub. - loves females, very affectionate with them, but is afraid of "some" men. He wasn't raised with men so is a bit timid with some guys, although he loved everyone at our Meet and Greet. He acts like a lab in every other way, loves to have things in his mouth, loves to play and play. He is totally housebroken, comes when called, is very inquisitive, will check out everything; even to what’s under the rugs. He loves good belly rubs, can be a “Velcro” dog, must be by you at all times and will need a transition period in his permanent home. He will go into his crate on his own, is great on leash, not a puller. He was raised with another male dog, but in the foster home prefers the female. 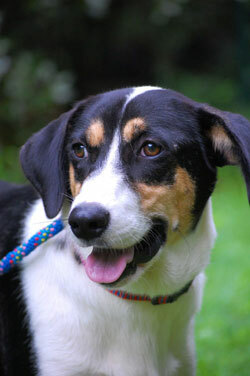 We would love for him to be an only dog or get adopted with his brother, Dover, as they were inseparable. He is an attention hog in his foster home and is very needy for his own person, but it could be that he misses his brother. History: As a pup his littermates were being given away at a Walmart in TN, so rescue stepped in and rescued the two before they got into the wrong hands. He will be at our Meet and Greet on Sat, 8/9/08 from 1--3 PM at Especially for Pets in Sudbury. 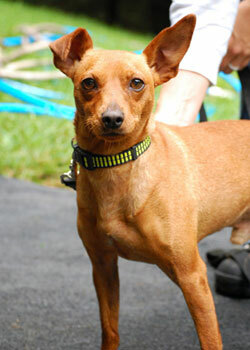 Jake is a 20# male Min Pin mix who is adorable and seems great with everyone he meets. He originated in TN, arrives early August, and will be shown around August 9th. He is very friendly, active and happy. Cute as can be. Jumps right in your lap; likes to be picked up and held. Seems good with kids and other dogs. No clue about cats. We think he is around 1 yr old....at least very young. A woman said she saw his owner and her little girl shove him out of their car and drive off. She took him in and brought him to the vet and asked for him to go to a rescue organization. The vet fostered him and said he loved her kids and was great with them, played and played. Obedience training is required and we would need to talk to your trainer if you have small children, to make sure he gets the proper reward-based training. We had so many applications for Jasper, we apologize we did not let everyone know. If we called everyone, it would have been at the expense of the dogs inhouse who are waiting for a good home. So sorry, but he got a great home. 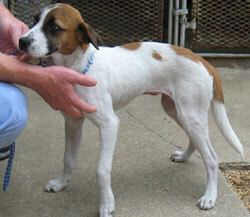 Jasper is a sweet young dog who was pulled just in time from a TN shelter where he was scheduled to be pts. Jasper is nuetered and up to date on all his shots. He is good with other dogs and simply ignores most of them. He has seen some cats walking by while he has been in his foster home and has not gotten excited, but he has never been tested up close with cats and we are not sure how he would react. He "tolerates" dogs but would certainly prefer to be an only dog. He LOVES people attention and will take anything he can get. Jasper is good on leash, in the car and in the crate. 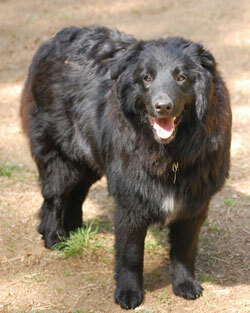 Jasper will be shown at our Meet and Greet at Especially for Pets on Sat from 1-3 PM. No phone calls please. 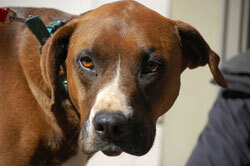 Lucy is a 3 year old spayed female Boxer/Great Dane mix. She originally came up from WV where she lived with a lot of other dogs. She was adopted, but was too sad in her home as an only dog and we just got her back. She has really perked up and loves to play with the other dogs all day long. She has to go to a home with at least one other dog, as that's where she will flourish. She's about 75 lbs and healthy, easy on leash, eats well, is a country bumpkin, likes to lie on a dog bed or sit in her crate when she's not playing with the other dogs. She is perfectly house trained, doesn't get into your stuff, and is up to date on vaccines. We prefer an experienced owner as she is a large breed dog. She will not be at our Meet and Greet, but will introduce her with private appointments at her foster home in Framingham. Sapphire is a sweet dog who showed up as a stray at a rural home in TN. She was very thin and so they fed and took care of her and soon she had puppies. Her puppies are Sugar, Spice, Saffron, Smokey, and Shadow. She seems to be a Shepherd mixed with either Husky or Norwegian Elkhound. She has a beautiful personality. The foster family had five kids and the youngest were 5 and 6 years old. She would bark if they got too close to the road. Smart dog! She is great with cats, we found out from her previous foster, and she would play with the rag doll cat and even lick her and give her a bath. Anyone who has a dog-savvy cat would be best as she likes to play. 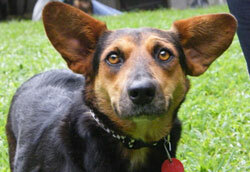 Sapphire will be at out Meet and Greet at Especially for Pets in Sudbury on 8/9 from 1-3 PM. Sasha is a young adult who was rescued with her brother, Sparky, in Tennessee when someone reported their neighbor had moved and left the two behind. She seems to be wonderful with everyone, including other dogs. She is spayed, up to date on all her shots and is on heart worm preventative. She is also good on leash and in the car and has seen cats walking by, but never truly been exposed to them. Sasha arrives on 8/6/08 and will be at out Meet and Greet at Especially for Pets in Sudbury on 8/9 from 1-3 PM. We had so many applications for Scruffy, we apologize we did not let everyone know. If we called everyone, it would have been at the expense of the dogs inhouse who are waiting for a good home. So sorry, but she got a great home. Scruffy is a sweet dog who was turned in to a a shelter with a high euthanasia rate in TN but pulled out by one of our contacts. She is around 10 lbs and very friendly. 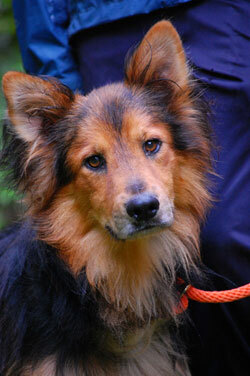 Scruffy will be arriving on the 6th and will be available for adoption on the 8th. She looks like a purebred daschund, but based on her "before picture," her coat texture resembles a poodle. She is the perfect little pocket dog looking to please. She LOVES people and will do just about anything to get all eyes on her. 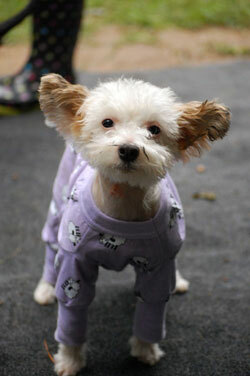 Unlike most small dogs, she is confident in new social situations and does not shy away from new people. She is very tolerant of other dogs and loves to play. Her big eyes make your heart melt and she knows just what to do to milk out the pats. (But is not overly pushy) She will be at our meet and greet on saturday at the Especially for Pets in Sudbury from 1-3 PM. No phone calls please. Snickers is an awesome puppy and is everyone's dream dog. She will play and play with her foster mom's pup, and then she take a long nap. 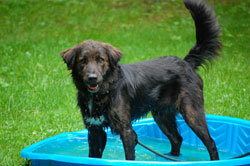 She is great with other dogs, loves people, is friendly and she loves the kiddie pool. Not much of a chaser of balls, but loves the sticks. She is still in her chewing phase too, and needs some good toys and bones to keep her attention. We're hoping for another dog, but as long as she will get time with other dogs, she will be happy. She is not a dog to sit in a crate all day, she just loves people too much!. She also loves petting and snuggling. History: She was found as a stray by in woman in TN. She is aprox. 6 months old and weighs a little over 25 lbs. The woman who found her requested she be put to sleep, as she had demodex mange and the woman did not want to pay for her treatment. As soon as the vet took Snickers, she immediately started to lick her hands and face. Because of Snicker's sweet disposition, the vet could not go through with the procedure, and requested a local rescue place her in a forever loving home. She was brought up to MA from TN and has been in a foster home for the past few weeks, waiting for the right adopter to come along and fall in love. If that person is you, please apply and we'll talk to you soon. She loves to play with other dogs and has enough energy that a fenced in yard would be a plus. The vet guessed she would be aprox. 35-40lbs fully grown. Sparky is a young adult who was rescued with his sister, Sasha, in Tennessee when someone reported their neighbor had moved and left the two behind. He seems to be wonderful with everyone, including other dogs. He and Annie were pals in their old foster home. He is neutured, up to date on all his shots and is on heart worm preventative. He is also good on leash and in the car and has seen cats walking by, but never truly been exposed to them. He is super sweet and follows Annie everywhere as they are pals. He would be great as a pal with another dog. He will be at the Meet and Greet on Sat, 8/9 at Especially for Pets in Sudbury from 1-3 PM. 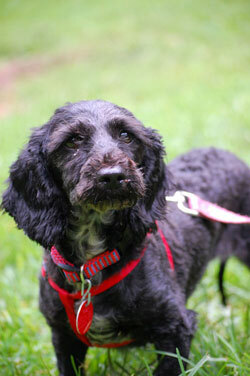 Splash is the smaller of the two males in the litter of two spaniel mixes that will be arriving in august. Their mother showed up as a stray in TN and a family took her in and allowed her to have her pups. 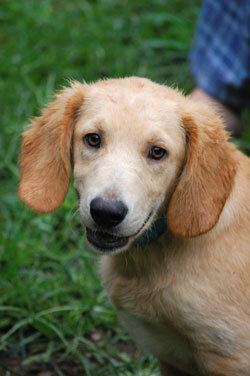 All of the pups are super friendly, playful and outgoing. We will know more about these little guys when they arrive. No phone calls please. He will be at the Meet and Greet on Sat, 8/9 at Especially for Pets in Sudbury from 1-3 PM. 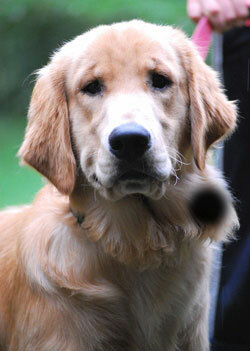 Tank is a 10 month old neutered Golden Retriever who is with us now and he is a big boy. We have a lot of applications for him but he is a big male and can dominate other dogs, so we are looking for a large breed experienced home. He was turned in down in TN by his owner after neighbors complained that the dog was always hanging around at their house and not being watched by his owner. 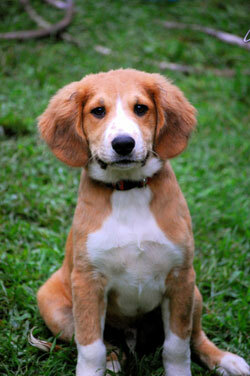 He is a fabulous dog, easily trainable, is friendly, calm, playful, and cute. He can jump a fence or will try to if left alone, so please do not ever leave him unattended. We had so many applications for Trooper, we apologize we did not let everyone know. If we called everyone, it would have been at the expense of the dogs inhouse who are waiting for a good home. So sorry, but he got a great home. Trooper and his pal Vegas ended up in a "high kill" shelter in TN, but he was the shelter favorite because of his friendly personality, so they let him live in the lobby and he was the official greeter. An ambassador for rescued dogs, he is coming up from TN in early August. He is smaller than he looks in the pictures. He has a brindle face and legs, but his body is black. He is cute and seems very good natured. He rides great in the car, is good on leash, fine with other dogs. He is great with other dogs and LOVES people. We would prefer a home without a cat as he would play with one just as he would another dog. His foster mom urges that he would make a great therapy dog as he is so relaxed, gentle and loving. Please no phone calls. Applications will be reviewed after he arrives. He will be at the Meet and Greet on Sat, 8/9 at Especially for Pets in Sudbury from 1-3 PM. 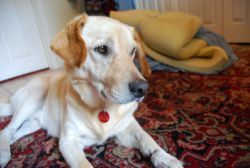 Cinnamon is a gorgeous neutered male yellow lab who has had a rough life. His family moved and left him behind, so he would go to the school every day looking for the kids. This dog sure deserves a great home. He loves going for rides in the car and he enjoys short walks. He is laid back and calm in the house. He is crate trained but doesn't touch anything when left alone. He is great with kids and is great with every dog he meets. He is a very loving boy who loves getting scratches. He will sit with you for hours being loved, but he is not nudgy or jumpy at all. He will need a good diet with as many natural foods as possible, he is currently on the raw diet and that's helping his coat to look great! He has a slight limp and we had it x-rayed and the vet said it looked like an old injury, possibly from getting hit by a car. It is not hip dysplasia as the ball looks perfectly round but there is some degeneration in the joint. 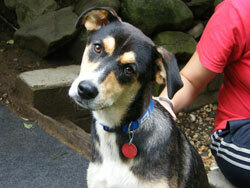 He was fostered in TN with Derek, Dover and Sapphire. Raggedy Ann is a very tiny Powder Puff Chinese Crested. She looks purebred and was from a breeder. She is spayed, utd on everything and is around 6#. She was estimated at 4-5 yrs old, but Chinese Cresteds have awful teeth and so during her MA health exam, the vet thought much young as she has never had a heat. The vet thinks maybe 2 years old. We're looking for a local home only, holistic only. She likes a lot of attention.....loves to sit in someone's lap or be held. She would be Happiest as the only dog because she needs a lot of loving. We would love to see her go to someone who stays home so she can get the time and attention she wants. We suspect she was crated most of her early life and don't want that to happen to her again. We also prefer a home where she will be fed holistic food and be given the proper nutritional care. Her history: She was dumped in front of a human society and was so scared it took several days to catch her. She has been in a loving foster home for almost a year as she was in rough shape and was very fearful. Now she loves to be held and we owe it to her to make sure she ends up in the loving arms of a committed adopter for the rest of her life. 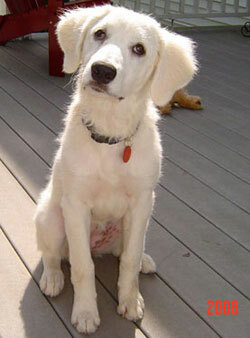 Zoey is a 5 month old Great Pyrenees mix. She was originally rescued with her sister, Tilly. Mom is Pyrenees, dad is Komondor. She looks like a white golden retriever, but looks can be deceiving and her parents are what they are and were seen by our contact in TN. If you adopt this breed, you must be willing to train as Pyrs are protective. Obedience training is required, first Puppy K and then Basic Obedience. She is a beautiful-looking dog but must be trained and we prefer she be adopted by someone who has trained their dogs with positive-reinforcement, reward-based training. She was not socialized with small children in her previous home but is doing great in her foster home, absolutely no issues. Still, she needs to be properly introduced and large breed dogs need always to be supervised with children. She will be at our Meet and Greet on Sat at Especially for Pets in Sudbury from 1-3 PM.